The Golden State Warriors defeated the Cleveland Cavaliers 108-85 in Game 4 of the NBA Finals and captured their second consecutive league championship on Friday at Quicken Loans Arena in Cleveland, Ohio. 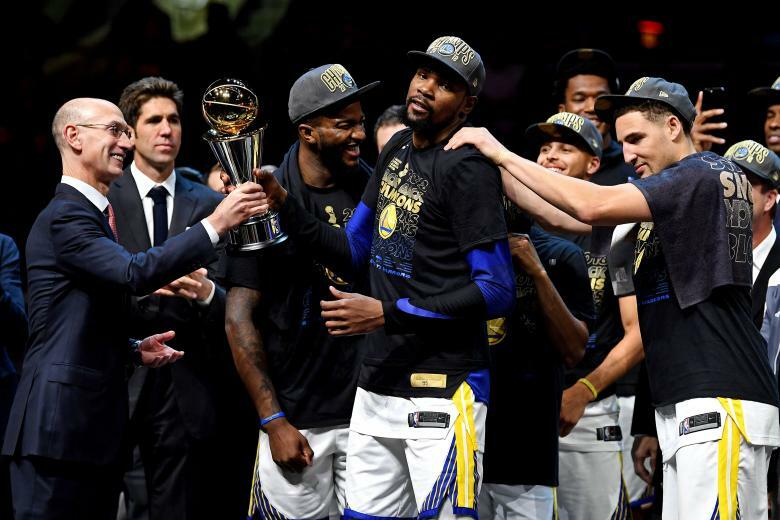 The Warriors swept the series and took their third championship in the last four seasons behind the play of small forward Kevin Durant, who won his second consecutive Finals MVP award after averaging 28.7 points, 10.7 rebounds and 7.5 assists per game in the series. He recorded a triple-double with 20 points, 12 rebounds and 10 assists in the series-clinching Game 4 win. In Game 3, Durant scored 43 points and averaged a double-double – 28.8 points and 10.8 rebounds per game – in the finals. Durant is the eleventh player in NBA history to win Finals MVP honors twice, joining six-time winner Michael Jordan, three-time winners Magic Johnson, Shaquille O’Neal, Tim Duncan and LeBron James, and two-time winners Kobe Bryant, Larry Bird, Hakeem Olajuwon, Willis Reed and Kareem Abdul-Jabbar. Stephen Curry led the Warriors in scoring with 37 points in Game 4 and finished second in the vote for Finals MVP. Cleveland’s James scored 23 points, 8 assists and 7 rebounds in Game 4 and finished the series averaging 34.0 points, 10.0 assists and 8.5 rebounds per game in a losing effort.